"Buy Nothing New Month", otherwise known as October, is nearly here. 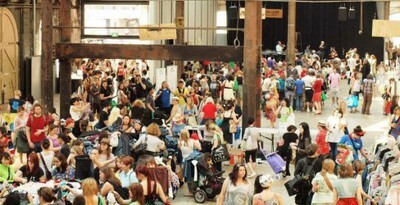 To celebrate The Clothing Exchange is holding a massive clothes swapping event at the BMW Edge, Federation Square. The swap will occur on Monday October the 8th. Raid your wardrobe and find 6 garments to swap. To participate all you need to do is buy a ticket for $25 and bring along 6 quality clothing items, that you no longer wish to wear, to swap. If this is your first time attending a clothes swapping event and you would like more information you can check out The Clothing Exchange's Guide to Swapping. Check in will occur between 6-7pm and swapping will begin at 7pm on the dot. All garments will be looked at by volunteers during check in to make sure they're up to swapping standard. For every garment checked in you'll receive a button. When the swap starts at 7pm, have a look at the clothing racks and pick out 6 of the items which tickle your fancy. There is a changing area to try clothing on. Once you've found your stash, head over to the desk where a volunteer will ask for a button for each item. You can then refill your wardrobe with your funky finds. If you would like to volunteer at any of The Clothing Exchange's clothes swap events you can find out more information by emailing The Clothing Exchange's contacts. When: 6pm. Monday the 8th of October. Cost: $25 and 6 items of clothing you would like to swap. We do a similar thing in our office, but for free. We just book out a room, and email everyone with the date and time. The people turn up with their clothes that they no longer want, go home with treasures that others don't want. As long as you contribute anything you can take as much as you want. Then any left overs go to the op shop. 6 buttons trade for 6 articles, wonderful night with nibbles etc all free. Left overs go to local charities. what does the $25 go towards?